According to the experts, leaky and inefficient windows account for more than 25% of the energy bills of the average household. However, there is good news. As a Toronto homeowner, you can cut energy costs by up to 15% when you buy windows with multi-pane insulated glass, heat-resistant coatings, and Energy Star ratings. Read on to find out how you can benefit from what the industry experts have to say about replacement windows in Toronto, ON. #1 Want to cut down on noise? It’s simpler than you may think. You can reduce noise when you buy insulated or double-pane windows with ¼-1 inch of air sandwiched between the panes. Wider air spaces, thicker glass, and gas fills like Argon or Krypton reduce noise even more. #2 Are your windows over 20 years old? If so, it may be time to think about replacing them. According to most manufacturers, your windows should be replaced about every 20 years or so. Signs of a failing window include draftiness, panes that collect ice, frost and condensation, or if a window is sealed or painted shut. Besides, a window that will not open or close is a safety hazard as it eliminates a potential exit for fire or other emergency? #3 Did you know that you can add custom grilles to any standard size window? The real plus is that special grilles don’t really jack up a window’s price by that much. Plus, you can have the grilles made based on a drawing or sketch. Ask Brock Doors and Windows about your options and costs of special grilles. #4 What type of window material is best for your home? While there are a variety of materials available for windows, the experts all agree that some are better than others. Wood is a good insulator against heat and cold, but it is costly, not only upon purchase, but in maintenance as well. Aluminum is more affordable than wood, but it is a great conductor of cold and heat, which is bad news if you were hoping to keep the cold weather out. So what is the material that most professionals recommend? Vinyl. Affordable and low maintenance, vinyl is also highly durable to changing temperatures. Vinyl will keep the outside weather out, and hold the good temperatures in. In the past, vinyl was limited as far as color and texture, but thanks to today’s technology, that is no longer the case. You can choose from a wide range of colors to fit any color and style of home. What’s more, you can get vinyl with wood grain technology in a variety of wood textures and stains. This way you can have all the allure of wood without any of the maintenance. Have you heard of Low-E glass? It’s glass with a microscopic metallic coating, which reflects heat back to its source. This feature will keep the heat inside your home in the winter, and out in the summer. Professionals state that probably the biggest benefit of Low-E coatings for home owners is the fact that they reduce your energy costs. 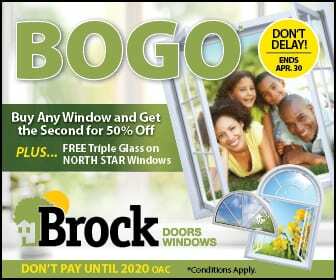 The experts from Brock Doors and Windows are here to help you every step along the way of your home improvement project. Give us a call for a free consultation today!